1. Changes may occur, since the last update, which affect the accuracy and availability of the information presented. 2. While considerable care and effort has been taken in the gathering of the data and compilation of the news and information, visitors should note that errors and/or omissions may occur. 3. Our Visitors are advised when making use or any decision based on information obtained from this site, to verify the information independently. 4. 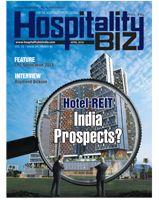 The management, authors, and project members of www.hospitalitybizindia.com shall not be liable for any damages caused as a result of the use of the information contained herein. 5. Accessibility of documents, programs, information, and any other material through this Web server does not imply suitability or endorsement for any purpose whatsoever by any parties.